Tomorrow I turn 42! I made my family promise they would not make or buy a traditional cake for me. 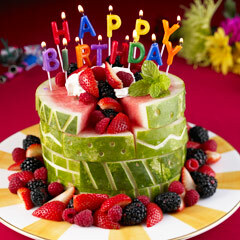 I could make a great Raw Living Food Cake, but I’ve been craving a Watermelon all day! My dad had his 73rd birthday yesterday and we indulged in a piece of his cake. I already had a sore throat and my taste buds were going on me, but I ate it all gone. Boy, was I sorry. Even today, just the thought of that cake makes me sick to my stomach. It was really beautiful but not what my body is used to, so this is what we are having tomorrow to celebrate my big day. Many people seek alternative treatment to the symptoms that are controlling them through their digestion. Many don’t know what’s happening until it’s too late in the stages and other complications gather to make a full feast of disease upon the body. Before I became interested in Raw Foods, I read Jordan Rubin’s Book. Patient Heal Thyself. I was both intrigued, shocked and amazed by the cover photos. Naturally, I wanted to read it cover to cover to hear his story. 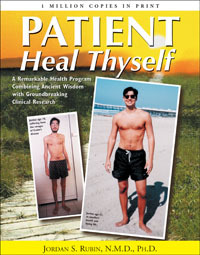 I was deeply moved and thus began my own self discovery of natural healing for my many symptoms. Even now, at almost 43 I find each day brings new feelings in the body that weren’t there before. It’s a cycle that needs to be on a routine maintenance program for purging toxins and filling the body with loving foods, minerals, vitamins and self acceptance. I HIGHLY recommend you read this book if you, or someone you know is experiencing Crohn’s or a similar disorder. So, here is my latest kick. I know sometimes I sound like I have ADD, but go with me on this one. Since I’m always whipping up something in the kitchen and having my family give me their honest feedback. Hahaha. Sometimes a little too honest, but I do appreciate it. I figured why am I spending all this time loving this process and spending money on the ingredients just for us? If I’m going to invest a large amount of time on something, shouldn’t I be getting paid for it? Actually, I do a lot of things just because I love to and don’t even think about a return in any manner. To me, it’s just not good Karma to expect something in return, but…the bottom line here is that business can be slow at times and it would be nice to fill the gap with a new venture. I decided to look into a Raw Chef Certification where I could learn additional skills and possibly get the knowledge and credibility I want to take one of my many ideas to market. Since I live in Southern Oregon, I am looking at Living Light in Fort Bragg, CA. Just a few hours drive time away, or Julliano’s in Santa Monica where I can stay with family while getting Certified. I don’t really want to be a chef at a restaurant. If I did, I think true culinary training with an understudy of vegan/raw cuisine would be in order. I guess I really need inspiration and sense of direction. This would allow me to be in the moment and place one foot in front of the other so new doors (or windows) can open for me. I love the energy and excitement hosting raw events, and I know I don’t need to go this direction, but this is what’s on my mind and I ponder what new business ventures I can begin after this training. I would LOVE to hear your feedback and suggestions.